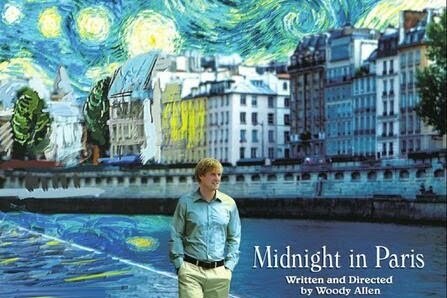 What better way to kick off Paris in July than by seeing Woody Allen’s newest movie, Midnight in Paris. The movie stars Owen Wilson, Rachel McAdams, Carla Bruni, Marion Colliard and a whole ensemble of actors to round out the film. I knew nothing about its plot when I went to see it, so I’ll try to keep spoilers to a minimum. The biggest things that drew me to the movie was the mere fact that it was set in Paris and is a Woody Allen movie. The movie, is about Gil Pender, a wannabe novelist currently working as a Hollywood screenwriter. He goes to Paris with his fiancee and her parents and soon discovers another world in Paris. One filled with all of his literary heroes from eras past. As much as I liked the movie, I didn’t fall in love with it the way others have. Woody Allen has hit the key spots of glamorizing the city and its history. I loved the cinematography, I loved the literary, artistic and musical references, I loved the fashions and I loved the concept of the movie. Woody Allen’s Paris is definitely not the Paris that I enjoyed when I was there, but I was definitely with Gil’s stance about the city throughout the entire film, which is utter adoration. What I didn’t like was the lack of depth in any of the characters (out of a cast of 10+ too). I didn’t like the abrupt ending, I didn’t like that many moments of Gil’s midnight strolls in Paris felt forced. I didn’t like Gil’s character, although I thought Owen Wilson was great in this role. His normally animated acting style was very muted in this film and reminded me of Will Ferrell in Stranger Than Fiction. As an English major with a minor in Humanities, I caught nearly every reference that made in the movie. It was great to see that all my knowledge hadn’t gone to waste, but still. I felt as if this movie was lacking something. If felt too much like an English major’s fantastical daydream of Paris. I think for a great movie with a lot of depth as well as fantastic shots of Paris, I’d rather watch Paris, Je’Taime.